4 Bedroom Semi Detached House For Sale in Nottingham for Offers Over £272,000. This four bedroom town house is ideal for a family looking for fantastic space and brilliant location! Built in 2007, this home is spread over three floors offering a large kitchen-diner to the rear of the property with French doors leading to the garden, a good-sized utility space which includes an extra sink of the Kitchen-diner, downstairs WC and a garage to the ground floor, a further large living room, master bedroom with en-suite on the 1st floor with three bedrooms and family bathroom on the 2nd floor. 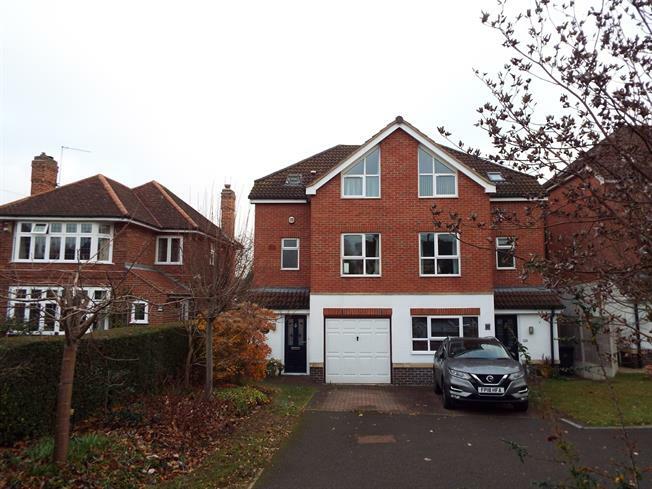 Outside the property benefits from off-road parking and mid-sized low maintenance rear garden. Call to arrange viewings now on 0115 943 1072. UPVC French double glazed door, opening onto the garden. Double glazed UPVC window overlooking the garden. Radiator. Fitted units, one and a half bowl sink with drainer, electric oven, gas hob, over hob extractor. Single sink with drainer, fitted cupboards. Tiled flooring. Double glazed UPVC window facing the rear overlooking the garden. Radiator and electric heater. Double glazed UPVC window with frosted glass facing the front. Heated towel rail. Double glazed velux window. Heated towel rail. Standard WC, panelled bath, shower over bath, wall-mounted sink, shaving point.